What is an Illinois Last Will and Testament? 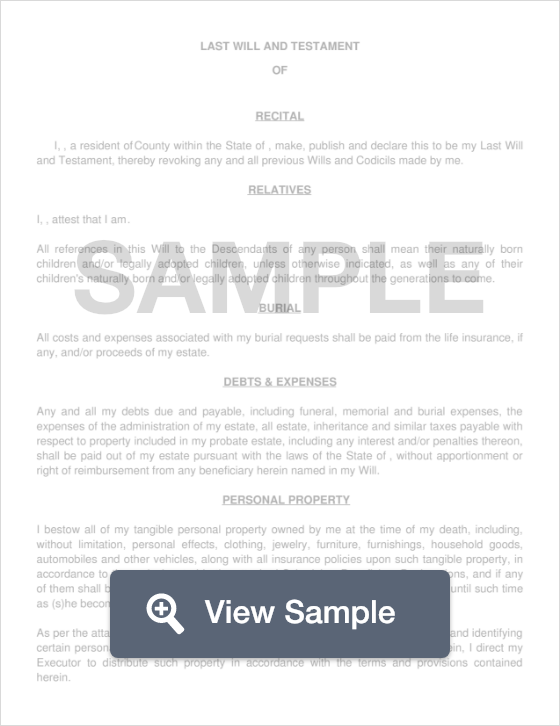 Illinois Last Will and Testament: What Is It? In the state of Illinois, a Last Will is a legal means of allowing someone (referred to as Testator) to distribute or pass down their assets and possessions once they pass away. This document can protect your assets, belongings, and money from being taken by unwanted individuals. In the state of Illinois, this is a legal document supported by state law, as long as two witnesses attest to its signing, and it is notarized by a Notary Public. Last Will and Testament documents are also referred to as “Last Wills” or “Wills”. Each state has its own set of laws, definitions, and signing requirements that relate to last will and testament documents. Below, these specifics are defined for the state of Illinois. Witnesses - According to Section 755 ILCS 5/4-3, the Will must be signed by two (2) witnesses who are both present when the Testator signs. Step 1 - Enter your name as well as your gender in the first section of your FormSwift Last Will template. Step 2 - Provide your city and county of residence. Children - Age? Living? Will they be named as beneficiaries? Life Insurance - Company name? Policy number? Contact information? Pets - Name? Species? Description? Step 5 - If you do have children, specify how much of your assets, which of your property, or what percentage of your assets you’d like to leave each child. Step 6 - If you’d like to set up a trust for someone, specify that in this section. Setting up a trust for someone who requires special care, such as someone with a mental illness or physical disability can prevent any issues with their ability to receive Supplemental Security and Medicaid benefits. Step 7 - Provide information on the age that your children must be when they will start receiving their inheritance. In addition, state the age that your children will be when their benefits come to an end. Step 8 - If you know which funeral home you’d like your body taken to after you pass away, provide the name and contact information of the home in this section. Step 9 - If you have any specific details that you would like followed in regards to the meal after your funeral service, provide those details here. Step 13 - Guardian for Minor Children - If you have children who are minors, appoint someone both you and they trust to act as their guardian. You may also want to name an alternate guardian as well as a conservator. Step 16 - Witnesses - Be sure to provide the following information about your witnesses. Be sure to have your witnesses and your Notary Public sign your document, attesting that you have drafted this document and are of sound mind doing so.